Click on model number to go to our new site www.dougcareequipment.com for more information including prices. Flavor Maker 115V/60/1PH 5-8 Lbs. Flavor Maker 115V/60/1PH 12-15 Lbs. Flavor Maker 115V/60/1PH 25 Lbs. 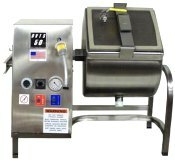 Daniels Food Equipment 115V/60/1PH 12.5 Lbs. Lexan see-through cover Stainless steel drum, housing and frame. Internal H.D. vacuum pump draws to 20" of mercury, removable drum, removable cover, variable speed, drain plug 300 series stainless steel drum, housing and frame. Built just like the large tumblers!